The 7oz 198g 22mm heel/18mm $130 Hoka Tracer will join the Hoka family in April 2016 as a fast, firm, well cushioned racer trainer. This is not your Grandma's soft Hoka! 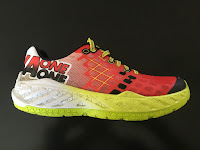 With Hoka sponsoring elite road and track runners, and with a rapidly growing base of regular runners training roads in Hok,s it makes sense that in addition to their traditional trail and ultra runner base they come out with more "minimal", relatively speaking, Hokas that are suitable for fast road racing and training. The Tracer is the first example. The Tracer part of the new Pro2Lite line introduces new technologies and constructions I have not previously seen in Hokas. A new dual density midsole construction puts softer foam in the rear of the shoe joining with slightly firmer foam in the forefoot. 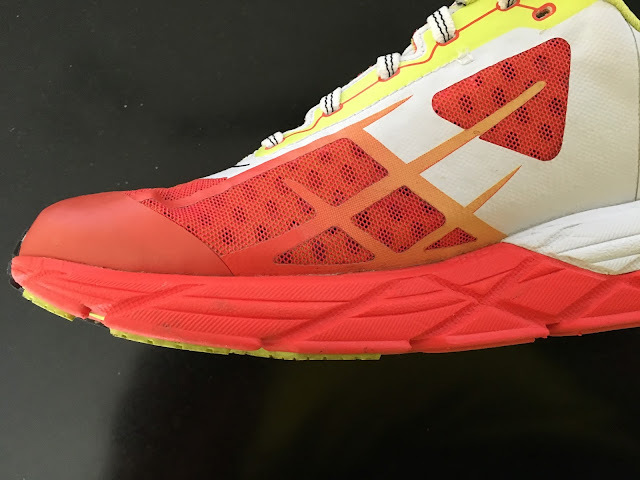 Hoka calls this approach Pro2Lite, a balance of "PROtection and PROpulsion". 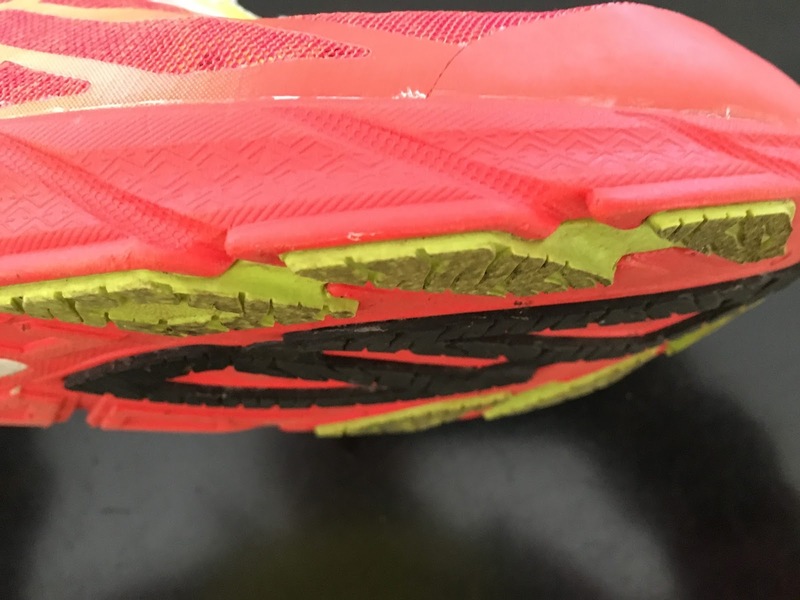 While not wide, the toe box area is particularly well executed, very light mesh supported by what now is becoming ubiquitous, a substantial TPU toe bumper which raises the front volume yet secures the foot given the rest of the soft unstructured mesh up front. For the first time a Hoka does not include Oversize Active Foot Frame, the midsole wrapping up around the foot to stabilize. The Tracer has a slight stability element through its dual density midsole. Hoka sent me a size 9, half size up from true to size as they were out my size. The fit is about perfect for me with medium weight run socks. Snug and secure with decent toe width and volume. I did replace the thin flimsy sock liner with a more substantial one. 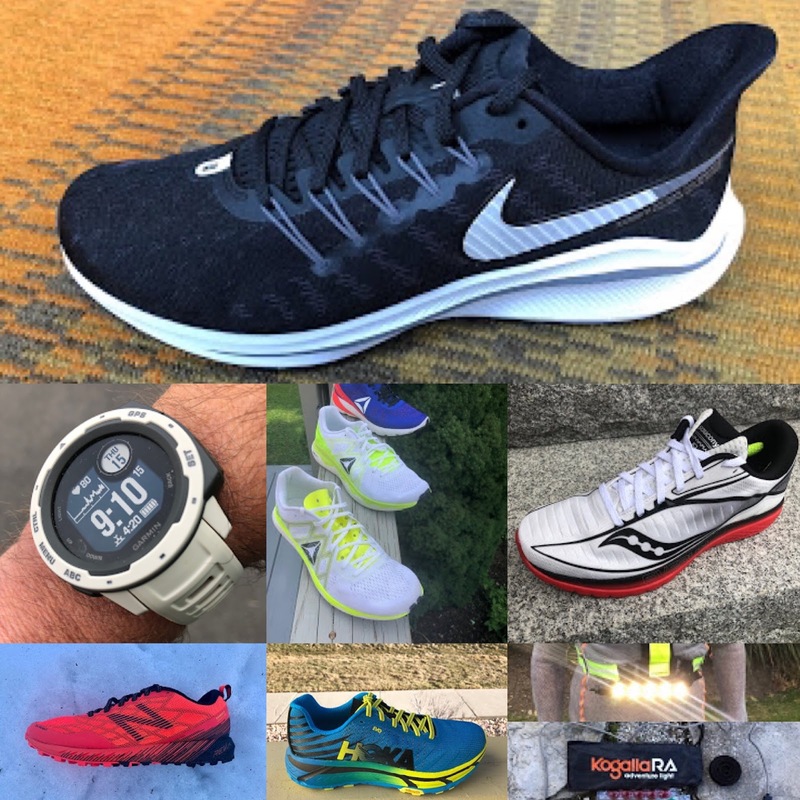 I believe the relatively unstructured toe box with very few overlays, somewhat forgiving, the thin but not overly stretchy upper, and the toe bumper which raises the front volume should accommodate most foot types except very wide feet, understanding that this is more a race fit than trainer fit. The upper is very breathable with good drainage. Behind the toe box the upper has a thin but substantial white overlay on the medial side to stabilize the foot. On the lateral side the open mesh extends further back with thin orange overlays. The tongue is a very thin leatherette and except for a bit of padding down the center essentially un padded. More padding at the lace up area would be appreciated although as the fit is snug and secure I did not have to lace very tight. The midsole is dual density with a rear (white) softer foam and a red firmer foam. The red firmer foam extends further back on the medial side providing some stability yet the medial side also has a thicker layer of white foam under the mid foot. The feel under foot is of a fairly distinct transition point at mid foot, not a hump as with the Skechers M-Strike but something, between softer and firmer foam. At speed is translates for me into less of a sense of transition in feel when I am more on the mid foot and with more rapid cadence than when running slower back on the heels. The forefoot flex is fairly stiff at first, with a distinct spring and it has taken a solid 20 miles to soften the flex more towards where I like it, so be aware of this when you first run them. More "seasoning" to go for me. Tracer is more flexible and with more of a distinct toe spring than either the Clifton2 or my favorite Huakas both with considerably more miles on them. The outsole is hard rubber and it is thin. I have seen no substantial wear to date but I would not expect huge from this outsole. After all this is a racing and fast running focused shoe and at 7oz the ratio of weight to cushion, be it firm cushion, is outstanding. The Tracer is a light weight, no compromises racer fast trainer. Its Pro2Lite dual density midsole represents a new direction for Hoka. Those used to prior Hokas such as the Clifton and even Huaka should expect a different experience although of those two I would place the Tracer closer in feel to the Huaka but firmer. What should one expect? A firmer ride for sure. Far better upper than any prior Hoka with no goofy compromises but a snug one with a great race fit toe box. When comparing to other shoes in its class the 7oz 22/18 stack Tracer is lighter by almost an ounce than the Kinvara 6 with the same stack heights and is firmer. I have not run in my Kinvaras recently. Tracer is close in specs but lighter than the New Balance Fresh Foam Zante again by about an ounce. I compared Zante and Tracer, one on each foot for a short run and the one ounce heavier Zante has a smoother more consistent cushion feel not surprising as the Zante Fresh Foam is one continuous material, harder heel outsole plug, and a bit less stable forefoot. I prefer the Tracer upper which is slightly roomier with no tightness under the arch or somewhat pointy toe of the Zante. The New Balance 1400 is another potential comparison. The 1400 is lighter by 0.7oz has a similar heel height but a considerably higher drop 23/13 leading to a 13mm forefoot which is to thin for me in even a racing shoe. Firmness of midsole otherwise quite similar as far as I can tell. The New Balance Vazee Pace is close in stack specs at 22/16 but heavier by an ounce. and shares the RevLite midsole with the 1400. I have not run in the Pace but suspect ride might be comparable to Tracer. The Altra Impulse I like so much (review here) is in the same general class. FootShape toe box aside, the upper fit of the Tracer is superior, a far more dialed in, smooth fit. Advantage in the forefoot feel and cushion to the Impulse. Both try to achieve some element of stability Impulse largely through the Stablipod outsoles and Tracer with its dual density Pro2Lite midsole Their heels feel quite similar on the firm side. I toyed with running the Tracer at my recent half but with only four miles on them went with the Impulse. They needed more seasoning of the forefoot flex. 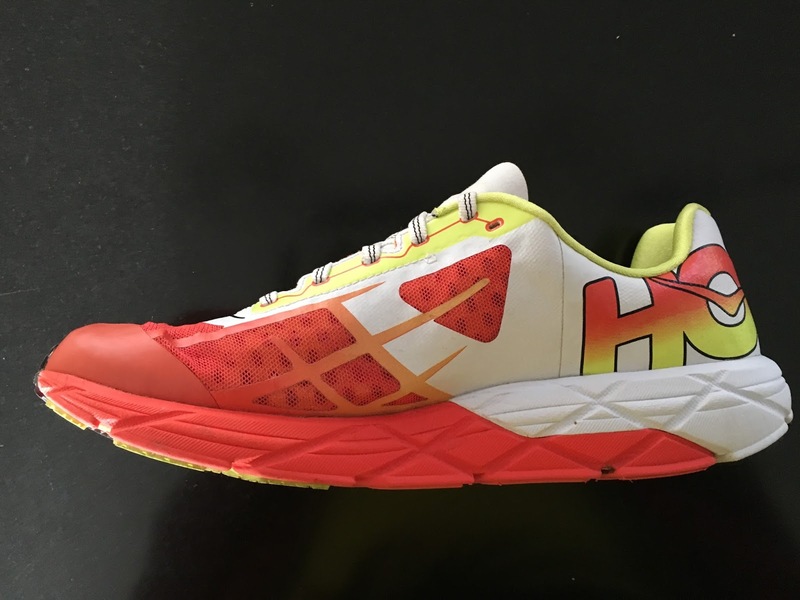 The Tracer does not feel or run like any prior Hoka. It is a firmer, no compromises racer trainer of the more "classic" variety. 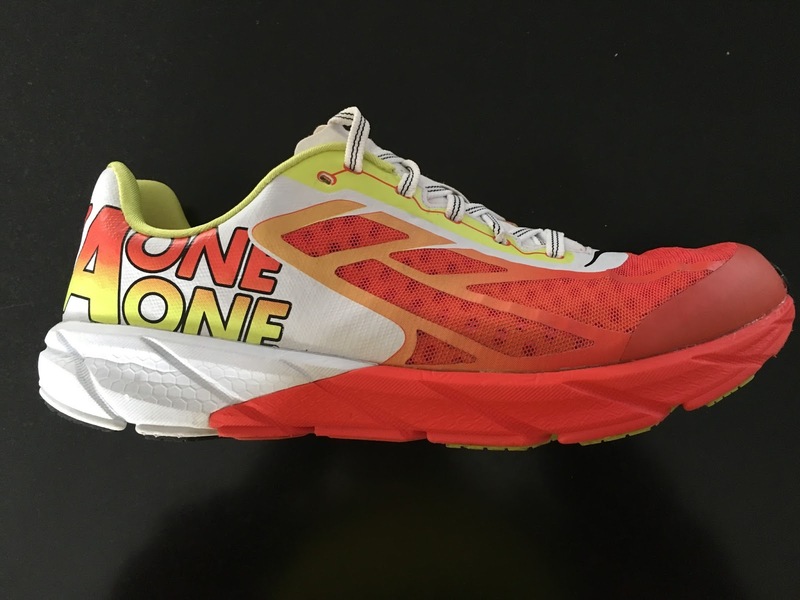 The upper is superb, the best of any Hoka I have run to date. The ride is not like being in a comfy chair as I have found with other Hokas, it means business. While firm, cushioning is very adequate with a snappy toe spring. I have not had sore legs after any of my runs in them, fresh legs after a Hoka trademark, even at speed,. The transition of foam densities takes some getting used to and favors running at speed and mid foot strikers. Tracer will be a 10K-half marathon shoe for me. Those who tend to run lighter firmer shoes but want some cushion will find them a solid choice for marathons. The Tracer was provided at no charge to RoadTrailRun. The opinions herein are entirely our own. Order the Tracer and Clayton from Running Warehouse. Available Now! Use COUPON CODE: RTR10 for 10% off! Tracer and Clayton are also available from the RoadTrailRun partners below. How are these comparing to the Huakas? Simply Opaque, Thanks for asking! Not at all the same animal. The Tracer is considerably firmer than Huaka and of course lighter too. Maybe compare it to a marathon race shoe such as NB 1400 with a somewhat more cushioned yet still firm forefoot. The Tracer is a more "traditional" firm low slung shoe than previous Hokas and a race day or speed work shoe. Any chance you could compare them to the feel of Newton pop 1's? Mike, I have not compared to Newton Pop 1. Both should be similarly firm and are targeted to similar faster paced running. What are you hearing about the Carbon Rocket? I like the Clifton but think it's a little soft for fast racing, like I'm losing energy return. I wonder which would be better, the Clayton, Tracer, or Carbon Rocket? I do like a stiffer shoe as it protects my bad big toe. Todd, I am hearing no Carbon Rocket. I have Clayton now. Firmer more responsive forefoot than Clifton. Still soft heel but more stable. Tracer is a full blown firm midsole racing flat. How does it compare to the Kinvara 7? You can also follow RoadTrailRun on Facebook: roadtrailrun.com and Twitter:roadtrailrun. Thanks for reading! Which of the 2 is more breathable? Yes no question Tracer is firmer than KInvara. Kinvara is far closer in ride to upcoming Hoka Clayton( review soon here). Breathability: nod to the Clayton. Very similar mesh to K7 but less front of the shoe overlays but more rear of the shoes overlays. Wider toe box: Tracer here too. Slightly wider, a touch softer lighter less dense mesh with fewer overlays. The Clayton is based in the same concept as the Tracer (firmer midfoot-forefoot, softer heel) so i think it will have a similar feel. Σπύρος Yes similar concept but especially in the heel the Tracer is considerably firmer. I've been running in the Clifton's, but I love Hoka in general. Training for a marathon in the fall and just wondering if you think that these would be suitable for that or if I should stick with the Cliftons. I'm in the same situation than Christrian, i just ran my first marathon (paris) with my Clifton in 3h30. I'm looking for a pair of shoes more responsive, 3h15 is my next objective, i'm 1.84m and 77kg, would you advice me the Tracer/Clayton for a marathon ? 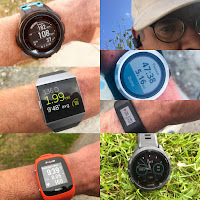 Hi Anonymous, Clayton will be more responsive and lighter than Clifton and I would say a better "next step" than Tracer which at pace might be a good 10K to Half shoe. You will find Clayton has considerably more pop than Clifton and a better upper with a roomy toe box. Don't size up. Some have issues with the active frame side walls at mid foot on Clayton so you may want to try first but by and large it should be a superb marathon shoe for your pace. My next marathon will be in them. Thanks for reading!